When it comes to choosing the right leather, the multitude of options can seem daunting at best. We spoke with Weaver Leather’s President Paul Weaver and he recommends asking yourself the following questions to help make the leather selection process easier. What should my finished project look like? I recommend thinking about how the item will be used as well as the intended user. Will it be used indoors or outdoors? Will the person be using it as a decorative item or as an item that requires heavy use? This is always a great way to get some insight into how the item should perform as well as how it should look to help you choose compatible leather. What strength and stretch tolerances should my leather have? When strength is considered a major factor, I recommend using full thickness leathers like skirting and harness as well as unsplit latigo and bridle leathers. Unsplit leathers are stronger and do not stretch as much as split leathers because all the fibers remain intact and are not weakened by the splitting process. Will I need to mould, case, carve, tool, stamp, curve or carve this leather? If these techniques are to be used, a dry leather such as skirting, strap or regular bridle leather is your best choice. I do not, however, recommend using regular bridle leather for tooling. What finish should the leather have? When moulding, stamping or tooling, you’ll usually put your own finish on the leather. If not, you should purchase a leather that’s already been finished by the tannery. The tannery can drum dye or spray the leather in a controlled environment for a professional, consistent finish. Will the item be used indoors or outdoors? For products exposed to harsh conditions, I recommend hot stuffed leather like harness, latigo or “English” bridle leather. If you’re moulding or stamping or using dry leather like skirting, be sure to apply oils, dyes and dressings to help prevent drying out and cracking. For items not exposed to harsh conditions, I’ve found that regular strap, bridle and chrome tanned leather usually work fine. For extra protection and long life, I recommend using leather care and conditioning products on all items. 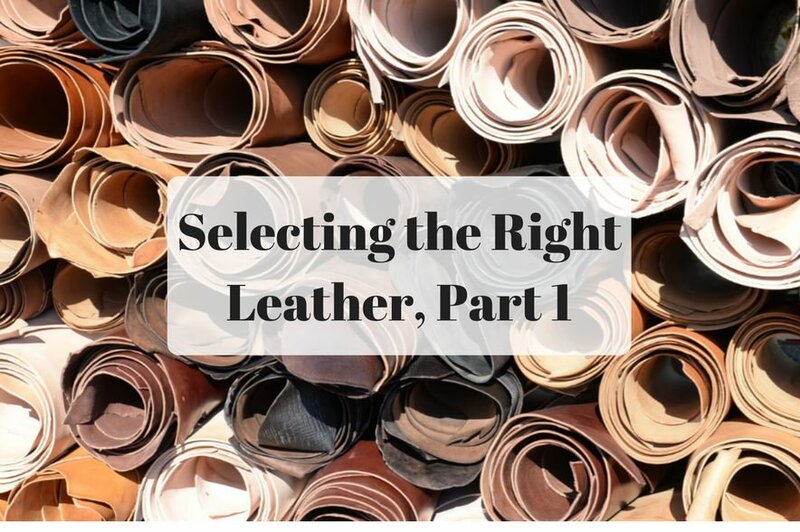 Coming soon, look for information regarding selecting the right cut of leather and how much leather to order in part 2 of this post.